There is nothing like spreading the load. That is true for work and it is true for campaigning. We are part of a Community Energy Coalition that has come together to champion renewable energy co-operatives. Earlier this year, we published a review of some of the inspiring practice that is emerging, written by Becky and Jenny Willis – itself following a roundtable of members led by Pat Conaty on theme of co-operation in energy. This ‘other’ coalition now numbers around two dozen civic society organisations, including the National Trust, National Farmers Union, National Federation of Women’s Institutes, the Church of England and the Campaign to Protect Rural England. 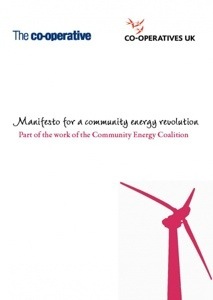 The Community Energy Manifesto we have published, with the Co-operative Group, is a clear and practical agenda to follow, if Government were minded to do so. And having talked through the manifesto at a coalition roundtable with the Lib Dem Secretary of State for Energy and Climate Change, it is clear that the door is open. It was Ed Davey himself who recently said that he wants “to see nothing short of a community energy revolution in the UK”. The most immediate challenge though is the Electricity Market Reform programme. With the kind support of Esmée Fairbairn Foundation and the JJ Charitable Trust, we have completed an expert review of the impact of the reforms on the community energy sector, by Cornwall Energy. The answer? The changes will, as currently designed, hinder the emerging community energy sector. More work is needed for a sustainable energy future for the UK. Let’s hope that by working together, we can move faster.